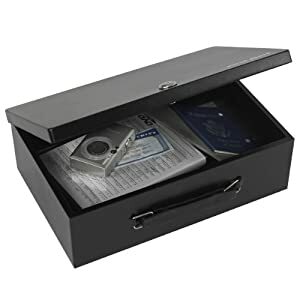 30 Best Fireproof Safes & Best Fireproof Document Box Reviews in 2019! This is an in-depth, comprehensive guide and review of the best document fireproof lockboxes, carry boxes, safes, cabinets, and drawers for 2018. In this comprehensive guide, we present you with the top 29 fireproof options for securing and storing your documents from fires, and in some instances from theft. 30. Steelwater Gun Safes AMFFC-200 This is the Steelwater AMFFC-200 fireproof filing cabinet. 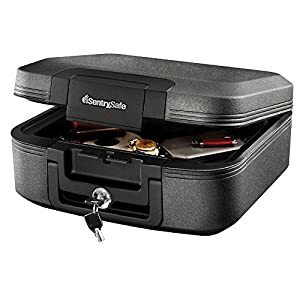 4.07 Cubic Ft.
Part I: Best Fireproof Boxes; these are lockboxes and carry cases for documents and small items, are fireproof and in some instances theft proof. 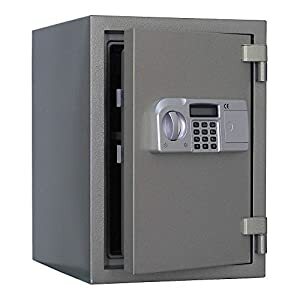 Part II: Best Fireproof Safes; these are documented safes, usually found in homes and offices, they are both fireproof and anti-theft. Part III: Best Fireproof Cabinets and Drawers; these are fireproof document storage options, are not really theft proof, but do come with a basic locking system. Each part presents a category, where the size, material, locking mechanism and fireproofing specifications are the key performance indicators for value. Fireproof boxes are essentially small safes or secured document boxes that are usually portable (due to their size, and possibly handle). They are essentially used for storing or transporting small items and documents. The First Alert 3031F deluxe locking steel box is a convenient size for storing most items that need to be secured from the fire as well as being easily transported from site to site. This lockbox has a double steel wall for extra insulation and is primarily used for securing against fire. It is not a safe, so it can be lock-picked and pried open. 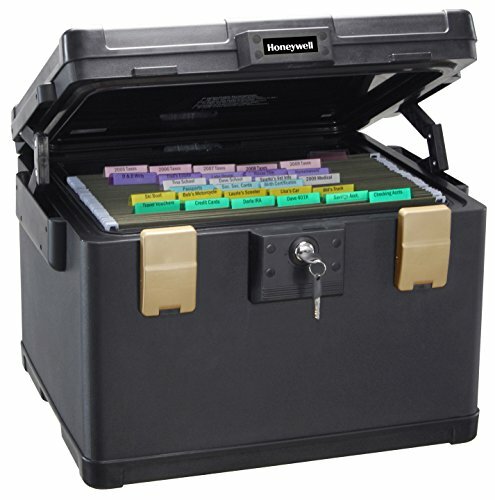 This is a very basic model, a no-nonsense fireproof lockbox, easily carried (lightweight) and easily opened. It is, however, a secure lockbox for home or office use and is compact enough to slip into most drawers and recesses. 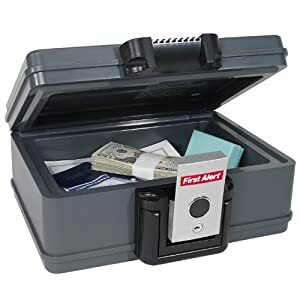 This amazing little safe box is quite versatile; it is both burglar proof (so long as it’s not carried away by hand, and is fire resistant for 1,500oF for up to 30 minutes which gives you ample time to save the contents. The inner dimensions are 3.70” x 11.33” x 7.09” and it can hold up to 0.17-cubic feet of contents and weighs 14lbs. The latch is a clamp, this adds extra securing performance, and it has a comfortable carrying handle for transportation purposes. 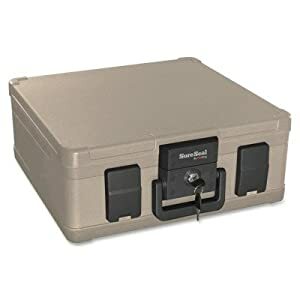 This is a very secure lockbox carrying case. It is weighty but not overly so. 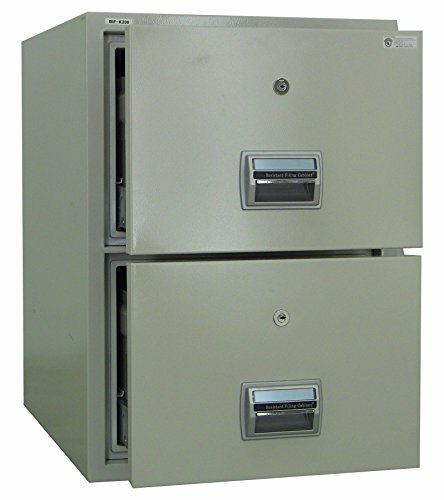 It makes for a very convenient petty cash and document storage unit for work or home use. This is the SentrySafe fireproof lockbox; it is designed to be placed in a secure or hidden location. It is not thief proof, but when locked will prevent basic attempts to gain entry. This unit does not come with a handle and is meant to be placed in a stable, safe location, preferably not suitable for transporting. 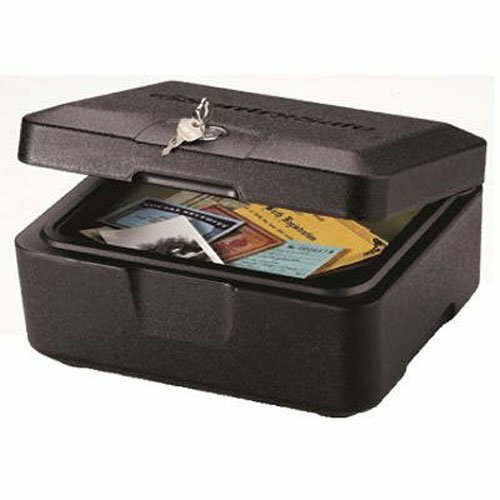 This is a standard lockbox with fireproof capabilities, its where you store petty cash, small valuables, and travel documents. 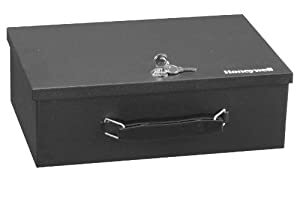 If you have a small store or need a petty cash box, its best to buy one that is fireproof as well as secure against prying, which is what this box provides you with. The Honeywell Model 6104 Fire Resistant Steel lockbox has a concealed handle which makes it very useful for transportation as well as being placed in a stable and hidden location. This model comes with a padded foam floor that will let you place objects securely from being scratched or banged about. This model comes with a double steel wall for 20 minutes of fire protection, and it has a durable external powder coating making it scratch proof, so it looks good even after a few years of use. Outer Dimensions: 4.2” x 12.7” x 8.7”. This is a very simple lockbox, no fancy designs or features, and is great for the office, shop or home use. 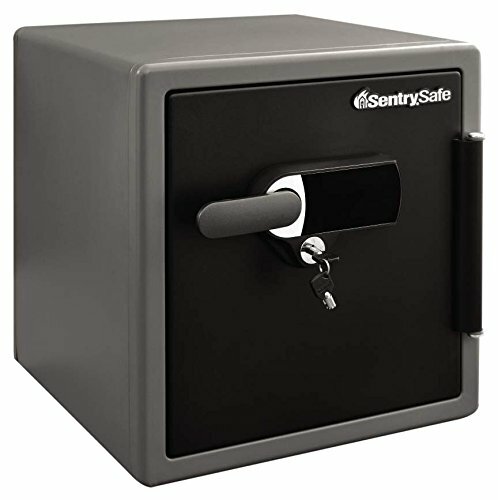 This SentrySafe lockbox model comes with a comfortable carry handle and design that makes the easy transfer of securities and valuables simple. The great thing about this box is that it is waterproof as well as fireproof, and it will withstand a flood. When you need to transport petty cash, valuables and travel documents, this option is exceptional. However, take into account its base weight, consider what you need to transport since this one is around 10Kgs when empty. However, it is a great fire and waterproof solution. This great little lockbox is both fireproof and waterproof. It will withstand full submersion for up to 2 hours and 30 minutes in a fire. Its neat chunky design makes it look good as well as perform admirably in any tense situation. This is an exceptional fire and waterproof solution; it is both roomy and reliable. It does weigh around 10Kgs so remember that you need to lug it around and the comfortable handle helps you do this. If its size you need and want to transport whole documents safely, then you need this SureSeal box. It is both fireproof and waterproof and will suffer full submersion, although it won’t stay underwater for long. 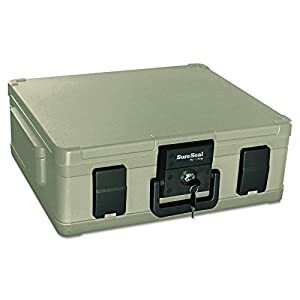 This heavy, rigid and durable lockbox floats. This is a very solid box and not for the weak, it weighs (56Lbs) 25Kgs, which is the weight of a sack of cement. If its size you need, as well as being portable, this heavy-duty box is perfect. However, it weighs over 20Kgs when empty; essentially this means that you need to be strong to carry it, or you need someone that will carry it for you. This is basically a portable safe. This model looks good and works even better. It can stay submerged for up to 24 hours and will resist temperatures of 1700oF for one hour. What makes this box great is it’s easy to carry design, the comfortable grip of the handle and the easy yet secure locking mechanism. This model is also proven to withstand heat as well as being beaten after being heated up, just to see if the lock was compromised, which it wasn’t. This is another heavy portable safe that gives you exceptional fire and waterproofing properties. It’s over 20Kgs weight makes it heavy enough to consider how to carry it. 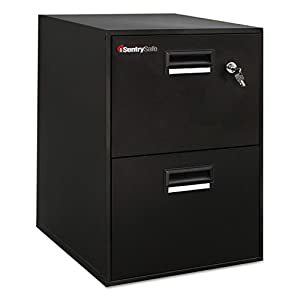 The SentrySafe fire-safe security filing cabinet is a small yet spacious solution for protecting your most important documents and hard copy files from the fire. This is not a safe, but it has a key, so it can stop prying eyes from initially looking in. It will protect your documents from a 1550oF fire for up to 30 minutes. It comes with a company guarantee to fully replace your box after a fire. 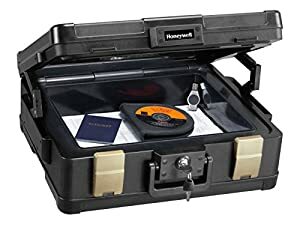 This is a portable file cabinet. Its small enough to carry around and big enough to place quite a few documents. However, it is not A4 or Legal size; you will need to fold documents in this box. 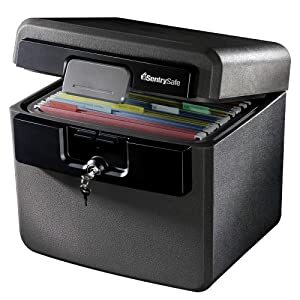 This Fire-resistant, waterproof filing locker is perfect for storing all your important documents securely from fires of up to 1,550oF for 30 minutes, and completely waterproof even when submerged. It is very large inside, bigger than most of its filing cabinet style competitors and has 0.62-cubic foot capacity. This fire-chest is an exceptional model for carrying around. 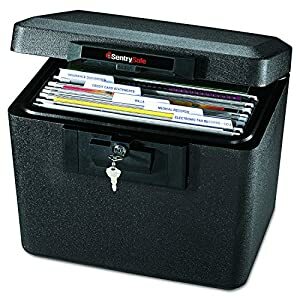 It’s basically a filing cabinet with a handle for easy handling and is large enough to hold A4 and legal paper documents. Honeywell Model 1108 Molded Fire/Water chest is not so much bigger than its competitors, but it does outshine them with its longer lasting resilience to both fire and water. This box will stay dry inside up to days submerged under 1 meter of water and will resist 1,700oF fires for up to 1 hour. This is a vehicle portable filing unit. It’s too heavy to be carried but too small to be a real office solution. It is actually great for home use, or if you do have only a few documents that need securing from fire, water or theft, then this one is a perfect match for you. It also sits well in any vehicles luggage area and can be a perfect vehicle transportation unit. If you are looking for the holy trinity of fire, water and portable document safe, then this is the model you want to get. This is the UL350 classified fire and waterproof FireKing safe. It comes with both one-hour resistance to 1,700oF fires and up to two days submerged under water. Basically, we had to seal this section with one of the best items on the list, it is highly versatile and is not too heavy. It will provide maximum protection, and as a safe will secure your documents from thieves too. 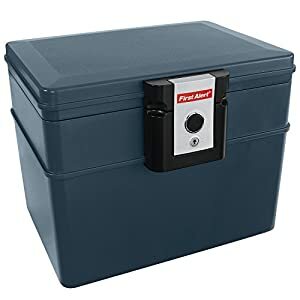 This is a great portable fire and waterproof safe box, it comes with a comfortable handle and weighs only 10Kgs when empty. It is large enough to handle A$ size documents as well as valuables. The safe is not only fireproof but waterproof which increases its importance. The safe guarantees to protect critical home or business documents, records, and valuables from fire damage. This large fireproof box will protect your stuff up to 30 minutes at 1550ºF temperature. The product is s UL classified. Also, the box provides waterproof protection for up to 72 hours so you can remain calm in case of a flood. The safe provides a great security giving you 2 keys. The manufacturer promises to replace your fire-resistant product. The safe is quite heavy, still, it is portable. Fireproof safes are safes that are designed to withstand fires and explosions. Some come with waterproofing as well, and a tri-secured safe is always better than a standard safe, especially if you live in a fire or flood-prone environment. 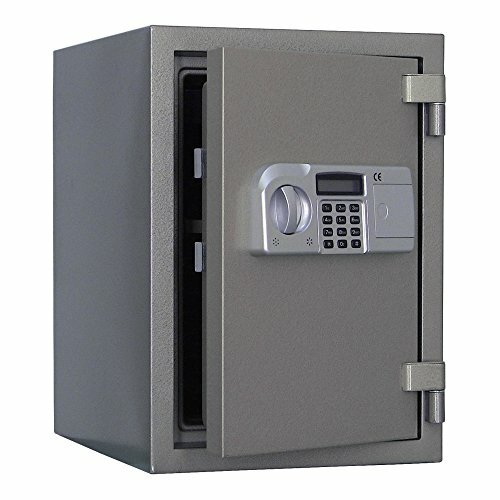 This safe is constructed with a 3mm steel door and a 2mm wall thickness. It comes with a battery operated digital p that uses 4 x ‘AA’ batteries. 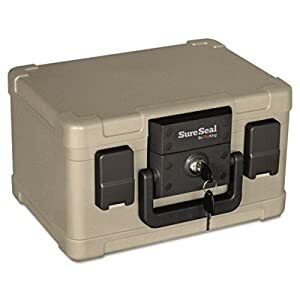 The safe is compact, with dimensions being 12.2’’ x 7.8’’ x 7.8’’ and weighs 10.32Lbs, which makes it extremely light, so you need to bolt it down with the pre-drilled anchor holes. The locking mechanism uses a dual security steel door locking bolts. The lock comes with a LED low battery indicator and 2 manual keys to use as an override for electronic failure. This safe offers only basic protection from fire and is not UL classified. However, its price reflects this point. This model of SentrySafe is perfect for fire and water protection. It meets UL classifications and will resist temperatures of up to 1700ºF for 1 hour. It is also ETL verified and will withstand a 15-foot drop. Add to this its ETL verified water resistance to 8” for 24 hours, and you get a comprehensive small safe solution that will protect your valuables from more than just burglars. This model comes with aloud tamper alarm as well as predrilled bolt-down holes. The interior includes a multi-position drawer and door pocket, and its internal dimensions are 13.8” x 12/6” x 11.9” and weighs 96Lbs, which makes it hard to lug away even if it is pried away from its mooring. This is a perfect small safe solution for any home or office. 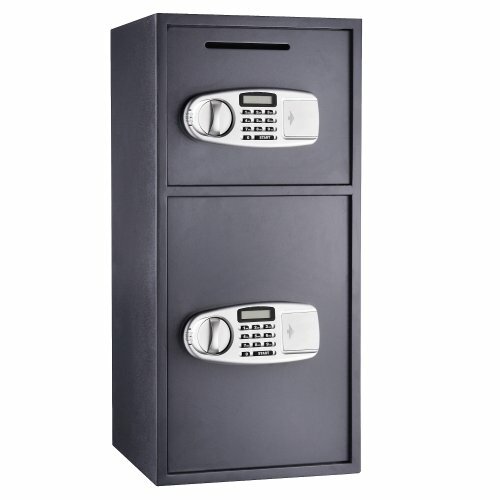 This model of SentrySafe, the SFW123DSB Combination Fire-Safe comes with an enhanced solid steel exterior. The bolting mechanism includes 4 x1” live-locking steel bolts which are 60% bigger than most other models. It also comes with their pry-resistant hinge bar design and a dual-combination lock and key for extra protection. The SentrySafe SFW123DSB Combination Fire-Safe meets UL classifications and will resist temperatures of up to 1700ºF for 1 hour. It is also ETL verified and will withstand a 15-foot drop, and it is also ETL verified water resistance to 8” for 24 hours. The interior of this model comes with a door key rack, a tray, and a pocket for small items, as well as an adjustable interior shelf. The internal dimensions are 17.8” x 16.3” x 19.3” and it weighs 101Lbs. This safe provides you with extra security and superior fire, water and explosion proofing. The Sentry Safe model SFW123GDC is similar in design to the SFW123DSB. However, this model is larger and more resilient. It comes with a 1-hour temperature resistance to 1700°F while maintaining the interior temperature below 350°F. It also protects the contents from water for up to 24hrs. The internal dimensions are 17.8” x 16.3” x 19.3” and it weighs 86.6Lbs with a capacity of 1.23 cubic feet. The interior is home to a door key rack, a tray, and a pocket for small items, and it comes with an interior LED light for easy viewing of the contents. If you want a really good tamper-proof secure safe, this is the one to get. Add to this its superior fireproof qualities, and you have a winner on your hands. The AmazonBasics Fire Resistant Safe is a 1.2 cubic foot fire resistant safe that meets basic requirement which is a 20-minute resistance to 1,200oF. It comes with 5 large 0.75-inch bolts and is made of 14-gauge steel. The interior comes with an adjustable shelf, and the keypad is operated by 1 x 9v battery. The internal dimensions are 12.5″ x9.6″ x 18.1″, and it comes with predrilled bolt holes for securing the safe in place. This is a basic safe, provides standard protection and is budget friendly. 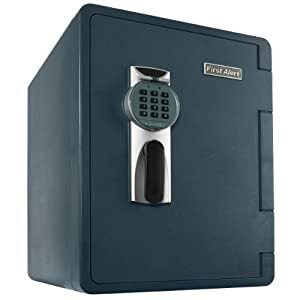 The 7803 ParaGuard Deluxe Safe by the Paragon Lock and Safe Co. is a great fireproof safe that offers great internal compartmentalization as well as two locking options, either a programmable electronic lock with buzzer and LED which you program a PIN between 3 to 8 numbers. The locking mechanism runs on 1x AA size (1.5V) battery. The internal dimensions are 22.25″ H x 14.75″ W x 13″ and includes a grey carpet mat padding and 2 Interior Shelves. This safe weighs 61.5Lbs. 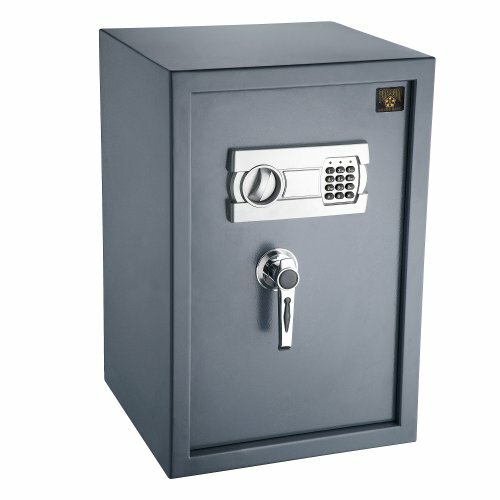 This safe gives you a bit more interior versatility, making it much sought after by multiple document/currency users. The Steelwater AMSWEL-500 is one of the more resilient and quality safes on the market. This model will withstand temperatures of up to 1850°F (1010ºC) for 2 hours, which goes beyond 90% of its competition. The body is a double steel shell, and the keypad is a 4-16 code programmable system with a non-volatile memory which is operated by 4 x AA alkaline batteries. This model comes with 2 x stationary locking bolts on the hinge side and a removable and adjustable shelf. It also comes with a ½” pre-drilled anchor hole. The inner dimensions are 15” x 9 3/8” x 12 1/8”, and the inner tray is 1 ½” deep and it weighs 115Lbs. This is an exceptional safe, with great fireproofing qualities and is highly resistant to tampering and prying. The Steelwater AMSWEL-500 is virtually identical to the AMSWEL-500 and is one of the more resilient and quality safes on the market. This model withstands temperatures of up to 1850°F (1010ºC) for 2 hours, which goes beyond 90% of its competition. The difference between the two models is that this one is a mechanical locking safe, and comes with a 4 number pre-set wheel non-changeable combination dial and key lock. This manual model of the Steelwater is a preferred version to those users that don’t want to deal with batteries. First Alert 2092DF Waterproof and Fire-Resistant Digital Safe are a larger safe, boasting 1.31 cubic feet storage capacity. This model comes with a programmable backlit Digital keypad with Emergency override key, and it is fireproof up to 1700oF for 1 hour and will maintain the inner temperature at 350oF. This safe is also waterproof for up to 1 day and will withstand flooding. The construction includes pry-resistant and 4 live door bolts, Its internal dimensions are Exterior 13.63” x 13.25” x 12.5”. This larger fire and waterproof safe comes with some exciting features and is good value for money. 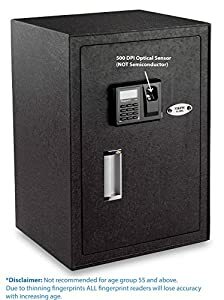 The VS-50BLX is a biometric locked safe, which means that you can open it by using a fingerprint, and as fingerprints are unique, no one can crack the code, because there is no code. Oops, sorry there is an additional PIN code to make things even more complicated. So now you need a fingerprint and a PIN code. Apart from its biometric lock, the VS-50BLX comes with a backup key that you can use in an emergency, such as no power or after a fire, when the lock is no longer functioning. 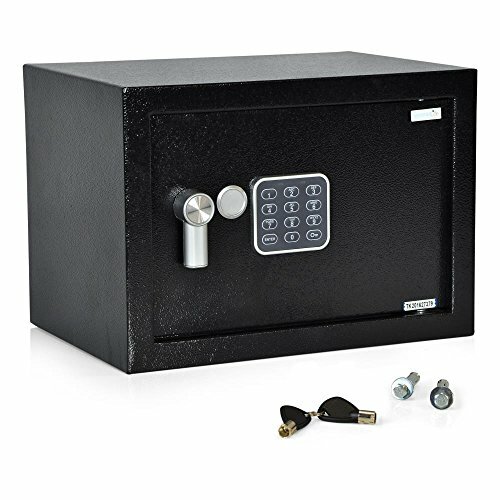 This safe also comes with 4 anchor bolts and 4 pre-drilled anchor holes. The lock is powered by 4 AA batteries. 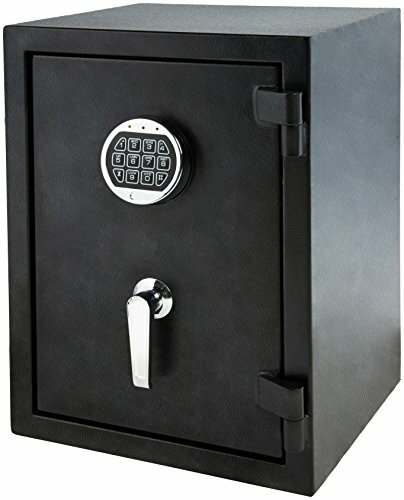 The body of this safe is made of a laser cut, seamless welded steel and is powder coated. Dimensions: 19.29” (502 mm) x 12.5” (298 mm) x 9.25” (349 mm), weigh 43Lbs. This is a biometric safe, so obviously its more secure than the others, but you have to remember, it requires a clean fingerprint, as well as a PIN code. It’s great for making sure you control all who use it. If you want a good deposit safe that is compartmentalized and will resist most environmental issues that this is the one to get. This model gives you two safes in one body, the upper safe is a deposit box with an electronic keypad and mechanical key, the lower safe is, the larger one and also comes with a double locking mechanism. The Paragon is made of 11-gauge steel and has concealed hinges to withstand attacks. It is powder coated both inside and outside. The interior has padded carpeting, and the unit comes with anchor bolts and pre-drilled anchor holes. The slot is 8.75” x 1.25” and the lock comes with a buzzer and LED display for 3 to 8 numbered codes, the mechanisms run off an AA 1.5V battery. The upper deposit safe’s internal dimensions are 10” x 14” x 13” and the lower larger safe ‘s inner dimensions are 20” x 14” x 13” and the whole shebang weighs 82Lbs. 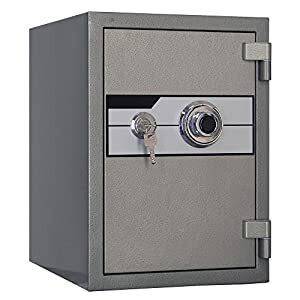 This is the best store/office deposit safe around. It provides you with double protection options and is fireproof too. Fireproof cabinets and drawers are a must in any office. There are always documents that require securing, even digital media storage is important, and nothing beats fire and waterproof cabinet. The best ones also come with explosion and drop proofing. 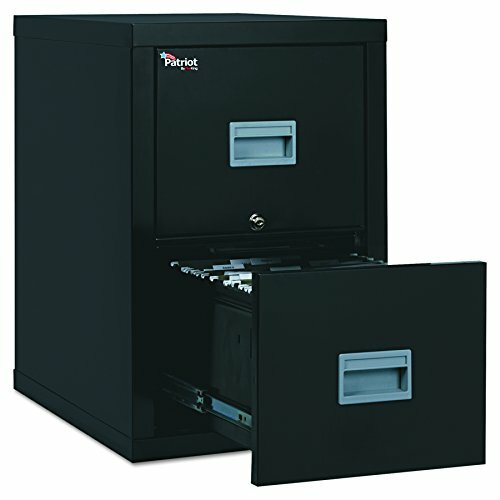 The FireKing is steel water and fire tested filing cabinet that will secure your documents from damage, as well as basic attempts of theft and lock tampering. The filing cabinet was tested in a real test, it was first preheated to 1,500oF for 1 hour, and then dropped out of a window onto a pile of rocks and passed. This cabinet’s fireproof lining is made of Gypsum, and the unit comes in two sizes, either the 31” or 25” deep drawer models. There is insulation between the drawers as well as in the walls of this cabinet. The locking mechanism is a dual cam lock, and the drawers come with recessed handles. A table and rigid unit, well worth the investment and offer very good protection from fire as well as when the floor caves in and it fell through. 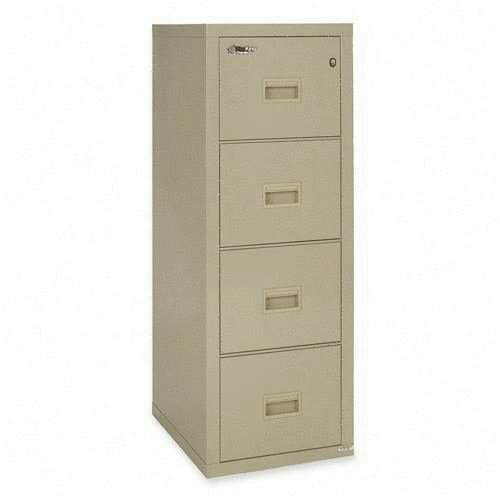 The SentrySafe 2B2100B is a large 2.08 cubic feet filing cabinet with very good fire-resistant properties. It is also heavy, making it a very sturdy model too. This beast weighs 202lbs when empty, and its dimensions are 15” x 12” x 10.2”, the drawers come with recessed handles. 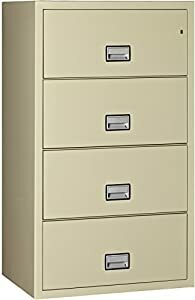 The filing cabinet comes with two drawers in a steel frame and gypsum fireproof lining between the walls and the drawers. It is UL Classified explosion hazard resistant, as well as ETL Verified water resistant to sprinkler systems and is, of course, UL Classified Fireproof. A very good home and office unit, and is quite budget friendly too. The FireKing model FIR2R1822CPA is constructed out of a steel lattice with superior fire, and explosion tested insulation and proofing. Some of the models also come with ECB-S S60P European Standards. Another great feature of this model is its incredible structural integrity. The system weighs 410Lbs when empty, and its inner dimensions are 15 1/4″ (387 mm) x 11 25/32″ (299 mm) x 19 17/32″ (496 mm). The locks are designed to resist basic tampering, making it a thief proof unit too. The whole unit is exceptional in its ability to resist fire, explosions, and water from overhead sprinkler units. 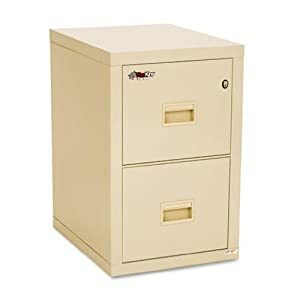 This is a budget-friendly office and home filing cabinet, it is also tamper proof too, which makes it well worth the cost. If you need a larger fireproof filing system, than the solidly built Phoenix model LAT4W31P is the one you should really consider buying. This 668lb behemoth provides you with perfect security against fires, as each drawer acts as a separate compartment. This means that if one drawer is open, the others are still protected. The drawers are secured using the Phoenix Labyrinth sealing system, which is a steel jacketed compartmentalized method that protects each drawer individually, as well as a waterproofing gasket system that secures each drawer from sprinkler system waters. Perhaps one of the best models on the market, its compartmentalized system is unchallenged. It makes sure that even an open drawer will not leave the other drawers susceptible to damage. The FireKing model 4R1822-C is a very strong, reliable and sturdy 4 drawer filing cabinet. Are dimensions are 22.1” x 17.8” x 52.8” and it weighs 435Lbs. This cabinet is constructed out of a steel lattice with superior fire, and explosion tested insulation and proofing. Some of the models also come with ECB-S S60P European Standards. 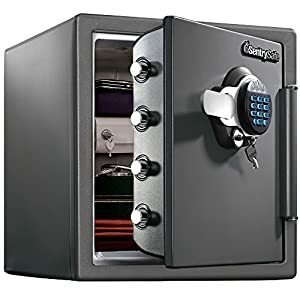 This model also features a UL listed high-security lock that picks and drill proof, and it comes with a two-position drawer catch. This is another great Fireking model and provides extra security from most fire-related emergencies. The Steelwater filing cabinet is also a virtual safe as well as a fireproof cabinet. This model comes with 4 solid steel locking bolts on each drawer, and the locking mechanism is drill and pry proof. The mechanism also comes with a 1 lock flip, which locks all the e drawers, this provides you with 2x the loading power of conventional “L” shaped rails. The model’s inner dimensions are 11 ¼” x 15 ¼” x 20 ½” and it weighs 372lbs. Its total capacity is 4.07 cubic feet. 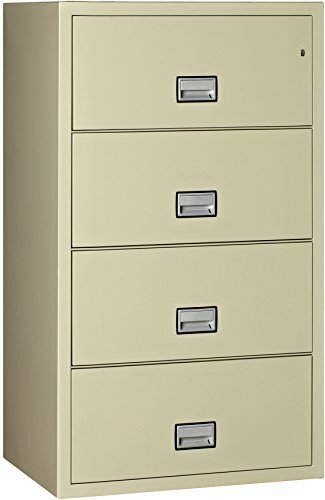 The drawers come with single pull handles, making this a very versatile and easy to use filing cabinet system. This is a great unit for storing heavy documents; its railing system is proven to be stronger than most competitors. So if you need to store heavy drawers, this is the one to get. Fire is the one major disaster that most businesses suffer at one point or another. Even in this digital age, there are certain documents and valuables that are not digital and require securing against damage as well as theft. This is why you need to consider all the alternatives and factor in the environmental conditions of where you live too. Consider forest fires, flooding, and tornados. These are just three natural disasters that hit parts of the US every year. Having a properly secured protection storage system will ease your mind as well as secure your special items. You must decide what the purpose of your fire and water protection requirements is. Do you need home or office security or is to transport documents and valuables? In the case of a portable requirement, you will need to consider the amount of data you need to transport; this will affect the dimensions and the weight of your solution. Consider whether you need only a personal security device or a larger device. A portable device is a lockbox or bag, while a larger device might include an armored car, or safe for the baggage of the vehicle you are using. You must factor in environmental conditions, this includes natural conditions such as flooding, fires, and accidents, while you must also add human created conditions such as war, riots and other activities that lead to possible theft, fire, and flooding. It is always best to go beyond what the industrial specification requires. In this instance, anything over 350oF is considered fire-resistant. 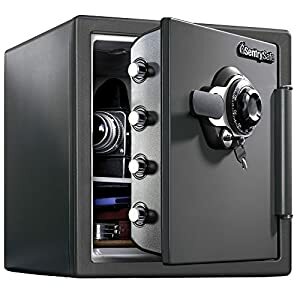 However, in the case of security issues and media, it’s best to buy a safe that can withstand temperatures above and beyond 1,500oF and maintain the inner temperature no more than 350oF. What you need to include in your considerations are the digital media devices you place in the safe or box, will their plastics and electronics withstand the temperatures. Papers, money, and documents might withstand the temperatures, but digital media and devices are susceptible to heat. Always check the devices temperature integrity levels, this will let you know if they can be secure in a fireproof safe. There are three types of waterproofing you need to consider, the most basic is rain and the elements, the second level is sprinkler systems and firemen and the third level is flooding. Rain and natural elements are for protecting portable devices, sprinkler systems and firemen will shower much more water than even a torrential rainstorm, so your devices need to be able to withstand this level of activity, and remember this will come when there is a fire. So your device needs to withstand extreme heat and then extreme cold. For flooding the issue is about the integrity of the seal, water pressures will eventually seep through most waterproof safe seals, that is why the manufacturers only define 1-2 days’ worth of protection. If you live in a flood-prone area, obviously don’t store the device in the expected flood water levels. Consider the portable devices, are they secure enough to withstand fire and water, if so, what is their weight? Fireproofing insulation and steel cages will increase the weight of the device considerably. Are you willing and capable of lifting a 25lbs security box/bag? With office and home storage units, some can weigh up to half a ton or even close a ton. Is your flooring and support infrastructure capable of supporting such a weight? What will happen in a fire? Will the floor burn and the device crash down to the lower level? Weight is an important factor when considering the correct device to carry or install. Are the inner dimensions of the device large enough to store all you need? Consider that at first, you might need less, but as time goes by you will end up storing more. Consider buying a larger device than you actually need to take into this accumulative factor. When considering dimensions, the inner dimensions are important for storing paperwork and other documents. However when installing a home or office unit, you have to consider the outer dimensions for fitting the device in specific constricted areas. Letter or Legal size makes a difference, in addition to the dimensions section, when buying a file cabinet, make sure the drawer width supports your document size. Also consider the opening mechanism, how the drawers slide out, and how to secure the system us when one drawer is opened during a fire or flood. There are four types of locks; these are the standard mechanical key, the combination lock, the electronic keypad lock and the biometric (fingerprint) lock. The electronic and biometric locks use batteries for their power source, so consider this and take into account the necessity to change these locks power source from time to time. Also, note that these locks come with a mechanical key for override purposes. This is due to power failures and electronics failures from fires, water, etc. Do not lose the key. Standard key locks and combination locks, as well as electronic locks, can come in single mode or combined. Single means you only need one method to open the safe, a combined method might include two or more systems, such as a mechanical key and the input of a keycode PIN. Double or triple security locks are obviously more secure, but more convoluted. Oops!! Sentry safe fire and water safe just reminded me of a flood incidence that would have claimed Scott’s life properties. The safe with firm and protective qualities is worth possessing, but on what basis will the warranty hold?